Title: "There's Just So Much Hate Within This Band. Why Are We Still Like this?" As they release an epic greatest hits, Manic Street Preachers remain as bright and furious as ever. Uncut joins them on a desolate Welsh beach to mull over the past two decades, and to draw a line in the sand. Next? "The third and final great leap forward..."
“Which was nothing compared to the one you had on your birthday,” says Wire. 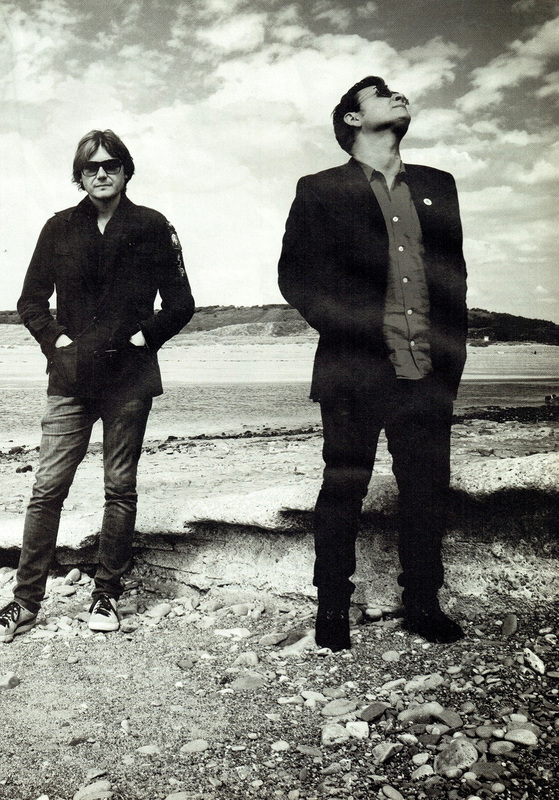 Welcome, once more, to the weird and hilarious world of the Manic Street Preachers. I love the Manics, not least for the reason that they are quite possibly the funniest people I have ever met. Partly because they’re witty and articulate, but mostly because there’s something glorious about the spectacle of frothing, helpless, impotent rage. 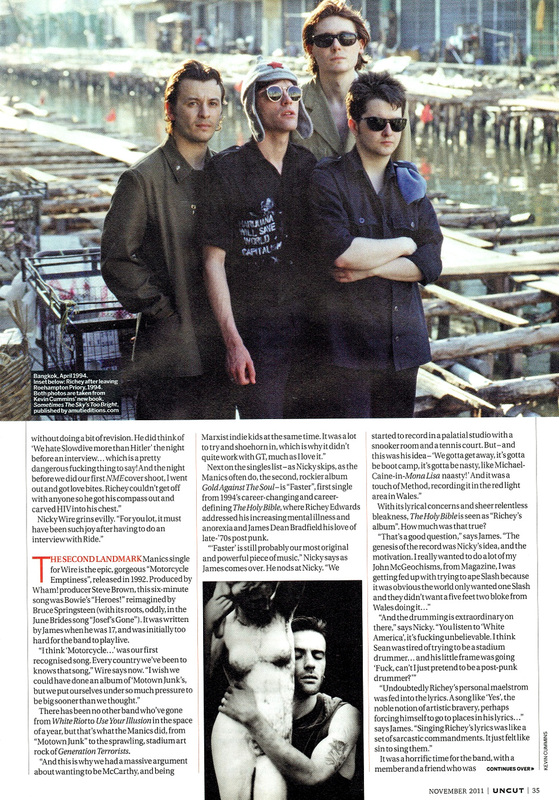 And the Manics are still angry as hell, boiling with scattergun fury. An innocent conversion in the car about favourite musicians suddenly takes a turn for the foaming when Brian Eno crops up. Manic Street Preachers HQ is Manicsesque the way the Batcave is Batmanesque. Downstairs, a studio with the original mixing desk from Rockfield Studios, posters - Aguirre: The Wrath Of God, a 2004 wallchart of the EU - and a small statue of Aneurin Bevan. Upstairs, two walls of Manics icon posters (James tests me on some and I fail) and a nice telly. On the couches are singles - the Television Personalities’ brilliant “A Sense of Belonging”, some stuff by left-wing sabotage band McCarthy and the artwork for early Manics 7” “Suicide Alley”. Nicky poses with a very broken Richey Edwards guitar - “I think it’s still got his blood on it” - and then settles on a sofa to discuss the business of the day. Ostensibly, we are here to talk about their epic new singles compilation set, National Treasures. Being the Manics, they’re also here to talk about their new album, provisionally entitled ‘70 Songs Of Hatred And Failure’. 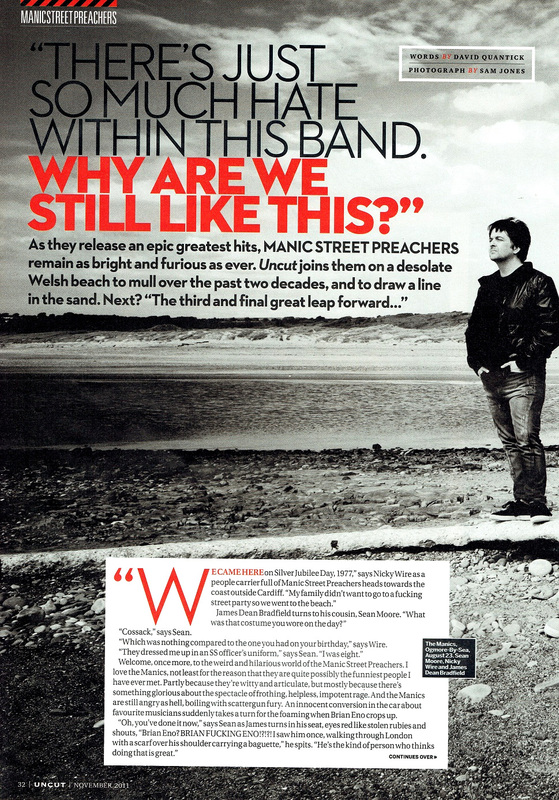 And, even more being the Manics, they’re also here to talk about going away for three years and coming back as a different group. But let’s start with the hits album. The Ziggy fans in the front row scream. Mick Ronson looks confused. What will you do in that time? More on this story as it unfolds. National Treasures will feature almost every Manic Street Preachers single, including a new cover of “This Is The Day” by The The. “Which,” Nicky claims, “is just an absolutely gorgeous, melancholic song which we’ve just Manicfied...Manicfied? Manicsified?” Sadly, it omits both their marvellous cover of Rihanna’s “Umbrella” and their great download-only festive single, “Ghosts Of Christmas”, which contains the fantastic line, “Hot Wheels on the dinner table/Too much sherry, Mum unstable”. I saw the band before I met them, as they walked down Charing Cross Road being photographed for the NME by Martyn Goodacre. With their leopardskin jackets, big hair and make-up, they looked, basically, like a bunch of women. 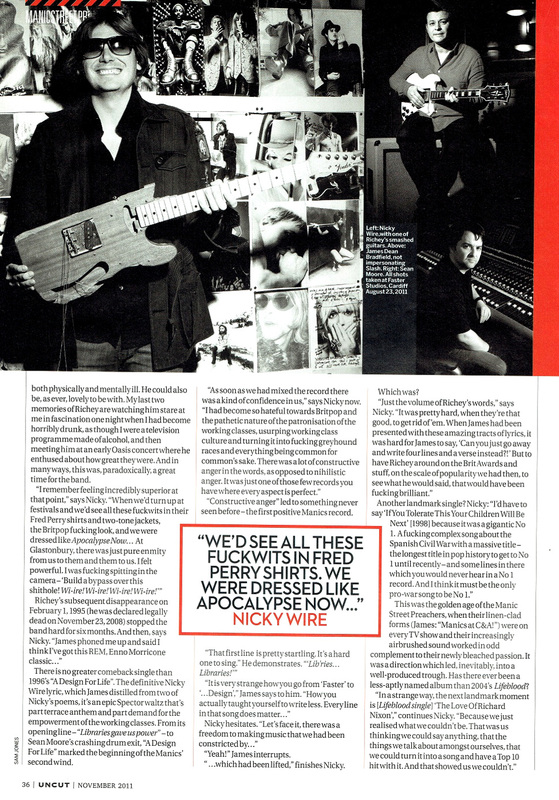 The Manics are great because there are layers to them. There were no bands who liked Guns N’ Roses who weren’t bad metal. No bands who liked The Clash who weren’t crappy punk bands. And no band who could read, with the late example of The Smiths, who were any good. And the Manic Street Preachers, ludicrous and daft as they were, meant it. He was also charming, more Syd Barrett than Sid Vicious. You always felt you were in the presence of somebody delightful. The second landmark Manics single for Wire is the epic, gorgeous “Motorcycle Emptiness”, released in 1992. Produced by Wham! producer Steve Brown, this six-minute song was Bowie’s “Heroes” reimagined by Bruce Springsteen (with its roots, oddly, in the June Brides song “Josef’s Gone”). It was written by James when he was 17, and was initially too hard for the band to play live. There has been no other band who’ve gone from White Riot to Use Your Illusion in the space of a year, but that’s what the Manics did, from “Motown Junk” to the sprawling, stadium art rock of Generation Terrorists. Next on the singles list - as Nicky skips, as the Manics often do, the second, rockier album Gold Against The Soul - is “Faster”, first single from 1994’s career-changing and career-defining The Holy Bible, where Richey Edwards addressed his increasing mental illness and anorexia and James Dean Bradfield his love of late-’70s post punk. With its lyrical concerns and sheer relentless bleakness, The Holy Bible is seen as “Richey’s album”. How much was that true? It was a horrific time for the band, with a member and a friend who was both physically and mentally ill. He could also be, as ever, lovely to be with. My last two memories of Richey are watching him stare at me in fascination one night when I had become horribly drunk, as though I were a television programme made of alcohol, and then meeting him at an early Oasis concert where he enthused about how great they were. And in many ways, this was, paradoxically, a great time for the band. There is no greater comeback single than 1996’s “A Design For Life”. The definitive Nicky Wire lyric, which James distilled from two of Nicky’s poems, it’s an epic Spector waltz that’s part terrace anthem and part demand for the empowerment of the working classes. From its opening line - “Libraries gave us power” - to Sean Moore’s crashing drum exit, “A Design For Life” marked the beginning of the Manics’ second wind. 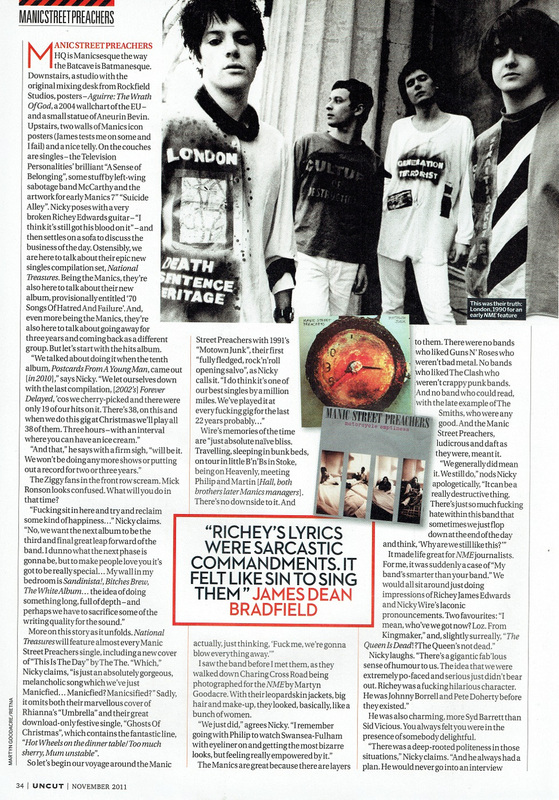 “Constructive anger” led to something never seen before - the first positive Manics record. “It is very strange how you go from ‘Faster’ to ‘...Design’,” James says to him. “...which had been lifted,” finishes Nicky. This was the golden age of the Manic Street Preachers, when their linen-clad forms (James: “Manics at C&A!”) were on every TV show and their increasingly airbrushed sound worked in odd complement to their newly bleached passion. It was a direction which led, inevitably, into a well-produced trough. Has there ever been a less-aptly named album than 2004’s Lifeblood? Really? 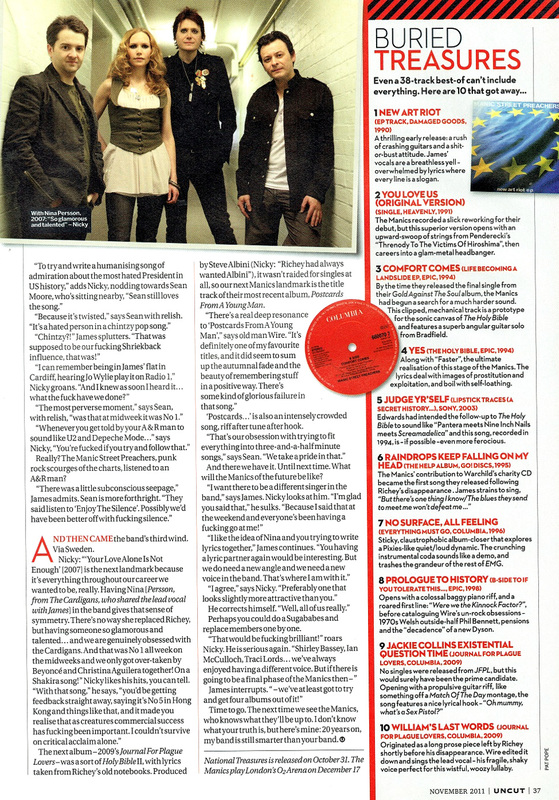 The Manic Street Preachers, punk rock scourges of the charts, listened to an A&R man? And then came the band’s third wind. Via Sweden. The next album - 2009’s Journal For Plague Lovers - was a sort of Holy Bible II, with lyrics taken from Richey’s old notebooks. Produced by Steve Albini (Nicky: “Richey had always wanted Albini”), it wasn’t raided for singles at all, so our next Manics landmark is the title track of their most recent album, Postcards From A Young Man. ‘Postcards...’ is also an intensely crowded song, riff after tune after hook. And there we have it. Until next time. What will the Manics of the future be like? Perhaps you could do a Sugababes and replace members one by one. Time to go. The next time we see the Manics, who knows what they’ll be up to. I don’t know what your truth is, but here’s mine: 20 years on, my band is still smarter than your band. This page was last modified on 29 September 2018, at 11:07.